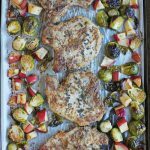 Roasted Pork Chops, Brussels Sprouts and Apples Sheet Pan Dinner is simple to make celebrating the tastes of autumn! 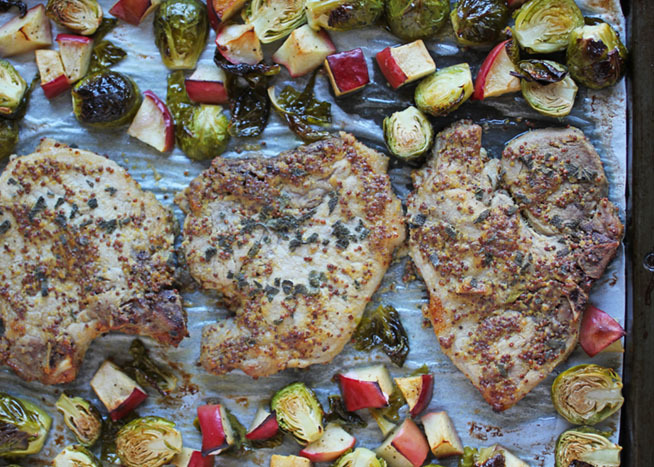 I don’t know when sheet pan dinners became all the rage, but I’m so glad they did! First of all, they are easy to throw together for a relatively low mess and quick dinner. Second, they involve my favorite cooking technique: roasting – especially when it comes to vegetables. Roasted vegetables, and I mean any kind of vegetable, always tastes better roasted, in my opinion! So I was excited to see this month’s Recipe Redux theme be sheet pan meals! I’ve dabbled with them here and there but this was the first time I really set out to get the flavors just right. And while some sheet pan meals, everything is flavored the same, that isn’t my preference. I like for it to all cook together, so some flavors may meld more than others, but I like to have some distinct tastes on my plate. 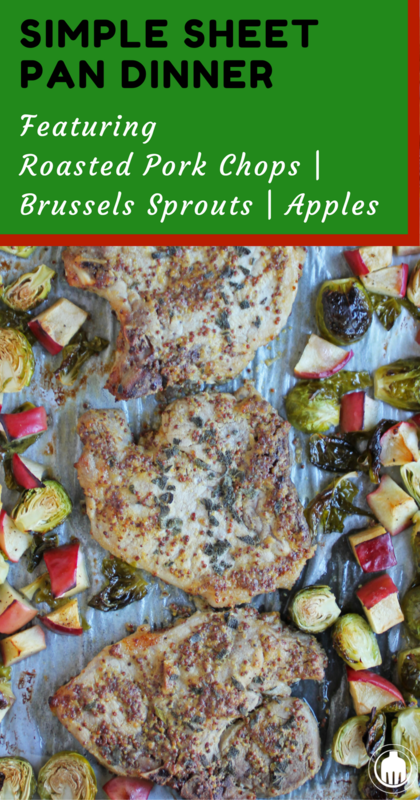 When Lesley and I were contemplating what to make, it just hit me that the perfect combo would be Brussels sprouts with apples and pork chops since we are headed into fall. It wasn’t that long ago that Brussels sprouts were not high on my list of vegetables to eat. That is until I came across a recipe on Regan Miller Jones’s blog for Roasted Brussels Sprouts and Apples. At the time I didn’t know much about Regan, except she was a fellow dietitian living in Georgia who had a love of good food and football (although she cheers for the wrong team, ahem!). I tried that recipe and have been a Brussels sprouts convert ever since. Now, Regan has moved on to bigger and better things: co-founder of Recipe Redux, Healthy Aperture, her newest project, This Unmillenial Life podcast is AMAZING!, and the list could go on…. While that first blog of hers may no longer be on the web, it’s memory lives on in mine (however fuzzy it may be at times)! 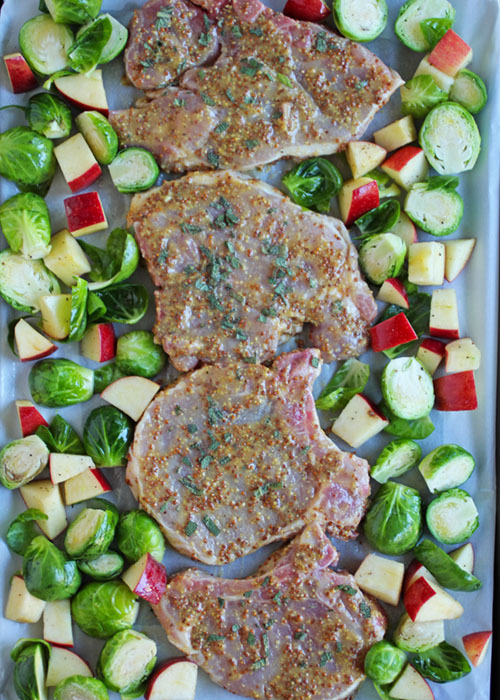 So I took what I could and turned it into my own with this sheet pan dinner. First, I prepared the pork so it had a little bit of time to marinate in the maple syrup and mustard mixture while I prepped the rest of the ingredients. 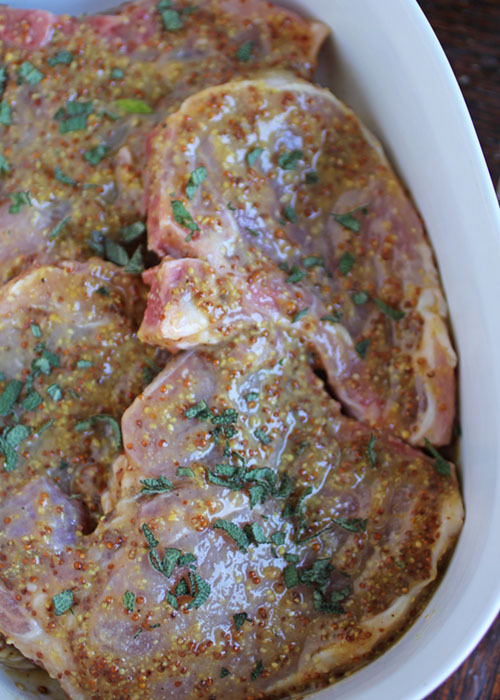 You could let the pork sit in the marinade all day if you wanted. 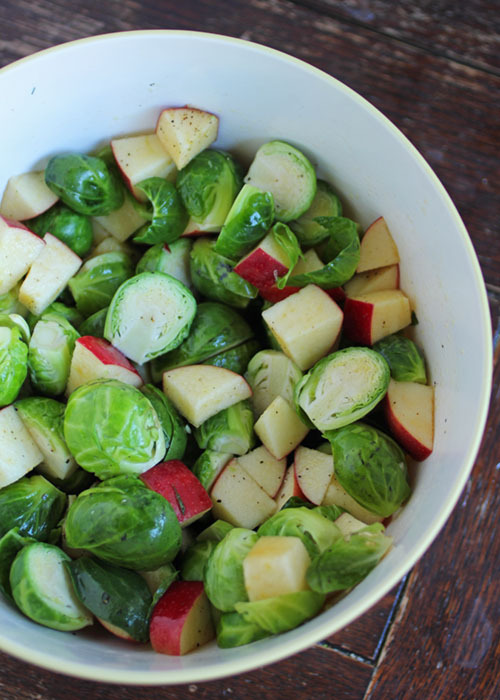 Next, I tossed the Brussels sprouts and apples in some white balsamic vinegar. I chose white because of its more delicate flavor and so it wouldn’t discolor the vegetables too much. By all means, use regular balsamic vinegar if that is all you have on hand. One time I made it, I even used a Cranberry Pear White Balsamic Vinegar that was given to me as a present which added a nice subtle seasonal flavor. I prefer to prepare the vegetables separate from the meat so that they each have their own unique flavors, rather than all taste the same. You can always just combine the vegetables on one side of the pan and the meat on the other if you don’t want additional bowls to clean. What is important though is to arrange everything in a single layer on the pan without too much crowding, otherwise they will steam rather than roast. Use a second sheet pan for any remaining vegetables if needed. Then roast in the oven for 20 to 25 minutes until done. I also turned my oven to broil for the last minute or two of cooking to brown the tops of the meat and veggies. No flipping required! And by using parchment paper on my pan, clean up was a cinch! 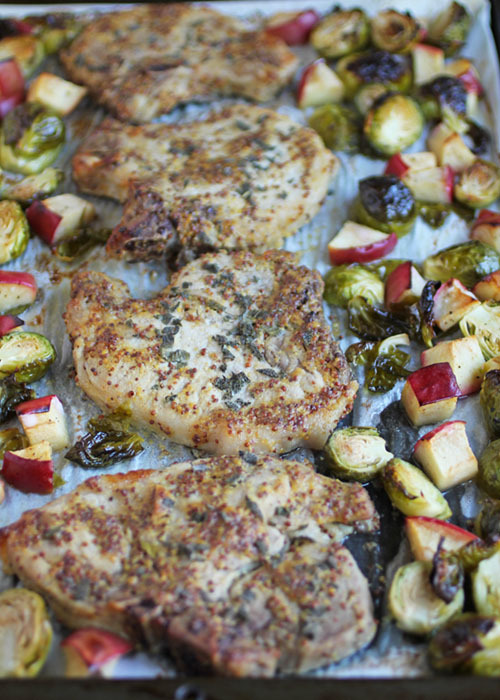 Be Sure To Check Out the Other Recipe Redux Sheet Pan Creations!